The Detroit Federation of Teachers has seen a number of challenges and triumphs since its founding in 1931 – a significant number of which occurred during the 21-year tenure of president Mary Ellen Riordan. Riordan guided the union through many transformative events, including the introduction of collective bargaining for teachers and the first teacher strike in Detroit, and was involved with various court cases that transformed education policy and public employee unions. Born Mary Ellen Hanlon in 1920 to Samuel and Cecilia Hanlon, Riordan grew up in a Catholic family. She earned a bachelor of science degree from Marygrove College and a Masters Degree from Columbia University in New York. She taught in the Detroit Public Schools for 14 years. Riordan’s last teaching job was as science instructor at Isaac Crary Elementary in Detroit, for grades 5 through 8. Riordan became involved with the Detroit Federation of Teachers early in her career. In an oral history interview, she described an encounter with Adelaide Hart that helped encourage her to join a union in January of 1945. Though previously she had been unsure, she came to see union activity as compatible with her Catholic values based on her study of the Rerum Novarum. Pope Leo XIII issued this encyclical, also known as Rights and Duties of Capital and Labor, in 1891. Riordan also agreed with the Detroit Federation of Teachers' focus on the practical needs of students and teachers. 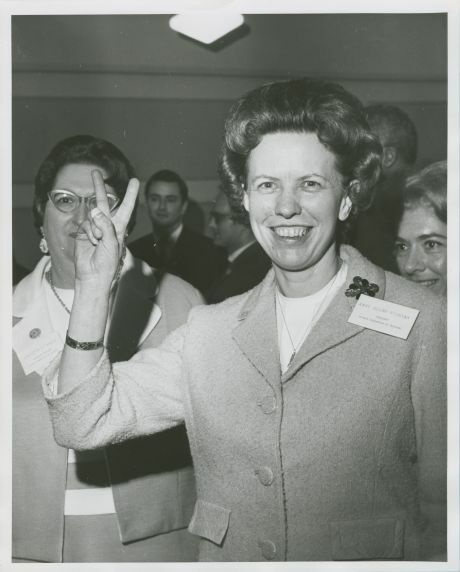 She became an active member and served on the union’s executive board starting in 1954, working alongside long-time leaders Hart, Antonia Kolar, Helen Bowers, and Mary Kastead. During the early years of Riordan’s involvement, the union focused on individual issues, such as textbooks for a particular grade level or sick leave for teachers. Few believed that teachers could have all those issues and more covered in a single contract. Many members of the public and even union leaders in other sectors did not believe teachers should belong to a union at all. Meanwhile, New York teachers were fighting for collective bargaining rights. The United Federation of Teachers went on strike in 1960 and won the country’s first collective bargaining agreement for teachers in 1962. Antonia Kolar presents Mary Ellen Riordan with a briefcase, the tag on which reads, in part: "Mary Ellen, the people's choice"
DFT members elected Riordan as their president in 1960. In February 1961 she became the first full-time president of the DFT. It was at that time the union began to discuss collective bargaining, which would allow Detroit teachers to have a single representative organization for discussions with the school board and place them in a stronger position to advocate for smaller class sizes, supplies, and better pay and working conditions. DFT had strong support from AFT headquarters. Bowers, DFT executive secretary, enlisted the help of David Selden, the former head of the Dearborn Federation of Teachers. Selden was an organizer for the American Federation of Teachers who became its president in 1968. He was heavily involved in the successful collective bargaining campaign in New York and he offered his advice to the Detroit union. Riordan and the DFT also went to Walter Reuther and the UAW for assistance. Reuther advised them to increase their membership, so in the fall of 1962, Riordan led the union in a successful membership drive. After the successful membership drive, the union planned to campaign for collective bargaining once Detroit public schools secured a millage in 1963. However, the millage failed to pass and the district made severe cuts. The union had to focus its fight again on the immediate needs of the students and teachers. The union also drafted a strike policy and came close to using it to convince the school board to hold an election. Teachers marched outside school board meetings before and after classes to show their support for collective bargaining. A strike ultimately proved unnecessary when the school board agreed to hold an election on May 11, 1964. The Detroit Federation of Teachers won over rival Detroit Education Association with 62 percent of the vote. DFT became to sole representative of teachers in the school system. Through the Teachers' Representative Committee, the DFT had an informal agreement with the school board, since teachers could not legally enter into collective bargaining contracts. Riordan worked to change that by helping lobby for a state collective bargaining law. In 1965, Michigan legislature passed the Public Employee Relations Act (PERA, or Act 379), which governor George Romney signed that August. The act established a framework for collective bargaining in Michigan, allowing school boards to enter formal contracts with an exclusive bargaining agent, and reduced penalties for public employee strikes. DFT and Detroit Public Schools representatives signed their first formal contract in December 1965. The DFT was only the third teachers’ union in the United States to have a collective bargaining agreement with its school board following New York City and Philadelphia. Within the next few years, teachers entered into collective bargaining agreements across the country. In addition to the initial collective bargaining success, Riordan guided the Detroit Federation of Teachers through strikes in 1967, 1973 and 1979, the Detroit Public Schools desegregation case Bradley v. Milliken, and agency fee case Abood v. Detroit Board of Education -- a precedent for Friedrichs v. California Teachers Union, which the U. S. Supreme Court will decide in 2016. Riordan also served on the AFT Executive Council and Committee, as well as many state and local organizations. In addition to these topics, Riordan’s papers contain a treasure trove of gems, including teaching materials from the 1930s and 1940s, snippets of Detroit life throughout that time, notes from her courses at Marygrove College, photographs and notes regarding her trips to the White House and her travels around the country and world. Researchers interested Detroit teachers should also search the AFT Local 231: Detroit Federation of Teachers Records and the Detroit Education Association Records. For more on early collective bargaining efforts, see AFSCME Office of the President Jerry Wurf Records and Gerald W. McEntee Records and UAW Vice President Wyndham Mortimer Papers. Stefanie Caloia was the AFT Project Archivist from August 2014 to February 2016. She is currently the Archivist for the American Federation of State, County, and Municipal Employees (AFSCME).